Reddish brown in colour, aging to dark brown/black. Made from freshly ground pine bark. Gives a fresh pine aroma. Do the acids from pine mulch damage plants? No. Organic acids in SPM® actually benefit the soil by lowering pH and providing organic matter. 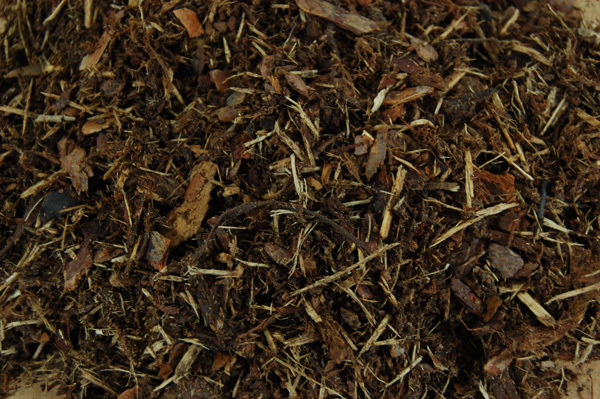 Hardwood mulches can contain phenolic acids which can be harmful to some plants and there is confusion at times between good acids and potentially damaging acids. Most plants are acutally grown in pine bark media at commercial growing operations, therefore pine acids are not an issue. Gro-Bark® SPM® is a beautiful mulch product that will help you maintain your landscapes in a safe and natural way. SPM® is now over 25 years old and it is still the number one choice of landscape professionals in Ontario. It is very consistent and always arrives at a job in a form that is easily spreadable. Unlike stringy fibrous mulches, once SPM® is established at a 4” depth in a bed, it is easy to top up with just an inch or two in subsequent years because it flows so easily. Great aroma and colour makes SPM® a great aesthetic choice as well.